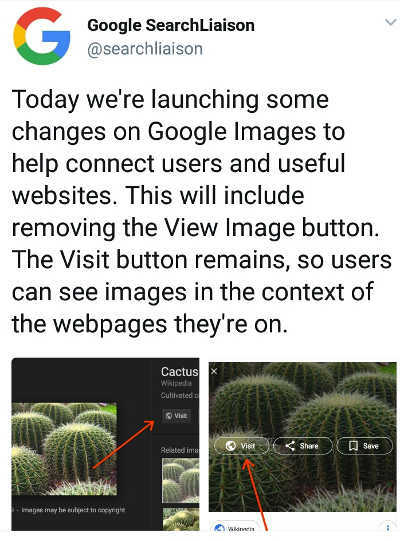 Google has removed the 'view image' feature (view image button) from their image search facility. This feature enables Google user to go to the image address or link by clicking the 'view image' button. Now Google remove this feature since Feb, 15 2008. Why Google remove this feature? What is the impact? and how to anticipate this? Below is the screen shot of image search result by Google. As you can see above, there is no view image button anymore in the Google image search result. There is also and additional information below the image that said 'image may subject to copyright'. Unfortunately i don't have a screenshoot from the previous image search result. This information has not published yet in the Google Blog but we can see in the actual Google image search appearance and also we can read tweet from Google SearchLiaison sharing this information. 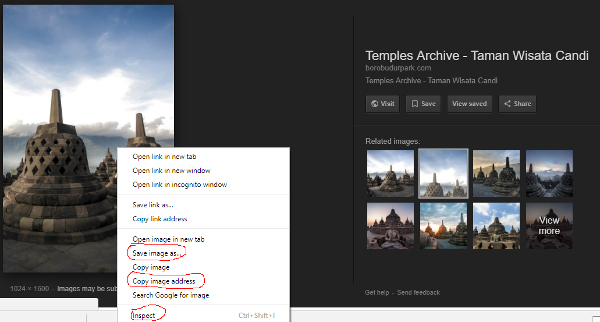 Why Google remove the 'view image' button form their image search result? 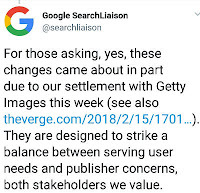 Google remove the view image button as impact of their legal case with Getty Image. Getty image has filed competition law complaint against Google inc. last Apr 26th, 2016. It is almost two years ago. Below is one paragraph of their complaint that is put in Getty Image press release. 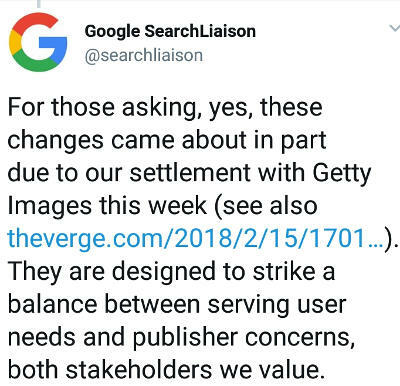 Getty Images’ complaint focuses specifically on changes made in 2013 to Google Images, the image search functionality of Google, which has not only impacted Getty Images’ image licensing business, but content creators around the world, by creating captivating galleries of high-resolution, copyrighted content. Because image consumption is immediate, once an image is displayed in high-resolution, large format, there is little impetus to view the image on the original source site. These changes have allowed Google to reinforce its role as the internet’s dominant search engine, maintaining monopoly over site traffic, engagement data and advertising spend. This has also promoted piracy, resulting in widespread copyright infringement, turning users into accidental pirates. What is the impact to the user? Many Google user showed an anger and disappointment of this step that is taken by Google. The image search will not convenient as before. Right now if we want to get the image from Google search we have to visit the site or blog that hosted the image and download it from there. It take more steps compare to previous Google image search that is equipped with 'View Image' button. User should load the whole blog post just to get the more detail information about the image. The worst thing is, sometime after clicking the hyperlink, we will be redirected to a some page without any image that we are searching for. The admin might removed the hyperlink in the post or the article might have been updated. In several cases, the admin might protect the image by disabling the right click so we can not save the image. From Blogger perspective, it will increase the traffic. It is good news actually for Blogger. The image will serve as back link our blog. I don't know the back link value but at least user need to click the image if they want to get more detail on image information (or resolution). Below is the example of Google image search when i search for 'code required for blogger'. When i click the picture, it will show the blog address and also a 'visit' button that will redirect to the address. So it good for blogger. The image will serve as hyperlink to our blog post and also to our blog domain address. There is a rick to get the image location from Google image search result after Google remove the 'view image' button. We can user Google Chrome or Mozilla Firefox to get the image. There are 3 ways of getting the image from Google search even after they remove the 'view image' button. Right click on the image and select 'inspect element', then see the image url and open it. So let's wait the next action from Google relating with their image search facility. I hope they can still give the best user experience in image search. 2 Responses to "Google remove 'view image' feature"
Food Photographer Dubai Awesome blog article.Really thank you! Awesome.